There’s an old saying about fences making good neighbors. While few would dispute this statement, fencing entails much more than that. Fences maintain borders, insure a degree of privacy and keep interlopers from romping through your rose garden and stepping on your pet dog or cat. Wrought iron gates and fences, however, go beyond the concept of border demarcation; they are often works of art that enhance your private landscape. Wrought iron gates and fences are highly versatile and can be made in any size or shape. Renowned author, Steven King, has a giant wrought iron gate that marks the entrance to his posh Maine estate. The hand-made masterpiece features a giant spider web motif that took two years to create. These structures can be as modest or as ornate as desired. Wrought iron gates and fences are shaped and fashioned by bending the metal into unique designs with creative flourishes. These decorative enclosures permit passersby to admire a backyard and colorful floral stands, but prevent a closer view of someone who may be relaxing by a pool with little if nothing on save a smile. Their beauty does not detract from their strength and durability (the fences, not the bathers). Wrought iron requires little maintenance, since weather tends to improve its appearance, rendering a worn and rustic look. Though difficult to damage, over time, these fences may need small repairs. The degree of rust or pitting that may occur depends on the function of the enclosure and where it is located on your property. If near a swimming pool, for example, there may be more rusting or pitting; if in an area that gets a great deal of rain and or snow and salt from nearby roadways, the metal can be adversely affected. Water may also settle in the creases and joints of the metal work because wrought iron fixtures often have designs that are curved and creased. Wrought iron gates may seem open, but appearances can be deceiving. Yes, you can see through them up to a point, but it is the top rail that comprises that point, and it is a sharp row of them at that. These intimidating spear-like peaks make the idea of scaling the fence or gate a most unpleasant proposition. These ornamental structures are custom- made, which means they are not cheap. Prices can range up to $200 per section depending on the degree of craftsmanship, the design, the size of the section and the cost of the total installation. You can achieve a stylish, handcrafted look without the hefty cost if you creatively examine the desired space. Will a simple gateway rather than a massive structure covering the entire yard suffice? How about a graceful stairway railing or one-of-a -kind metal balcony? Wrought iron has a beauty all its own that is both enduring and graceful. Plant arbors can make a beautiful addition to any garden, but they are also useful for growing things like roses. A climbing rose will look fabulous, and so will things like vines and other climbing plants. Even tomatoes can be grown on an arbor. They will turn a so-so garden into a romantic hideaway, but their usefulness is unmatched in the gardening world. They can be used to grow things upon, as an impressive entrance to a garden or virtually any area of the outside home. Even a simple arbor in the front or back yard can look great, although it is very important to choose one that goes with the style of the home. A garden can be a lot of work, but don’t forget to create a place to enjoy the area as well. Place one by a bench or waterfall for ultimate enjoyment. They are also great for weddings as well. A beautiful white arbor, with lovely roses growing on it can be a great addition to an outdoor wedding. There are many different styles and colors of plant arbors to choose from. They can be found made of wood, metal and even plastic. They come in virtually every color or can be painted to a certain color, if that color cannot be found. Arbors aren’t just for the spring and summer either, imagine one covered with snow or surrounded by leaves in the fall. They can add appeal and structure to an otherwise bleak landscape anytime of the year. 4. Do not choose an arbor that is too large or too small, make sure it fits correctly and blends into the garden or area that it will be in. There are many different uses for plant arbors, and they can make an attractive addition to any garden. They are great for any type of landscape, coming in a variety of styles and colors. There are tons of different plants to choose from to grow on the arbor, or it can just be left empty. Either way it will look fabulous. 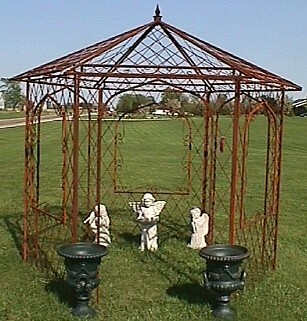 Combine more than one arbor to create a unique style, or just use a simple stand-alone structure. Take time to consider the style and where it will fit into the garden, and it will be loved by family and friends for years to come. Landscaping a yard is a pleasure to do. It takes planning and patience. Whether you are a do it yourself type of person or prefer to hire out work, the vision you have as to what your yard will look like when finished is something to always keep in mind. This will keep you sane as your yard progresses from landscape in progress to an oasis of personalized beauty. Decorative garden border edging is a beautiful way to enhance your yard. The choices as to what to border and edge with are only as limited as your imagination. You can use wooden borders such as cedar, willow, bamboo or log. Wrought iron and stone are also popular ways to border and edge your lawn. Wrought iron borders come in many different patterns, and finishes and there are a lot of choices as to texture and type of rock if you decided to go with a stone border. Using aluminum gooseneck pipes, which are made for washing machines, can create a fun and unique border. This edging can easily adapt to any shape of yard, plant or flowerbed as it turns at the joints. Looking around at home improvement stores or researching garden border edging on the internet will give you a taste as to all the different and beautiful options you have to choose from. Decorative garden border edging is a great way to keep different areas of your yard separated and different sections of your lawn looking tidy. It provides clean lines and adds definition to garden plots, walkways and driveways. It could also be used to circle trees. One option is to lay a brick walkway around flower or vegetable gardens and then edge the walkway with matching brick or wrought iron. Creativity is key and your taste and expertise as to what looks beautiful to you will add a personal touch to your yard. Practically speaking, decorative garden border edging is also a wonderful way to protect your yard from pests. A low border fence can help prevent rabbits from destroying your plants and border fences with a little more height will help to keep out deer. Nothing is more frustrating than waking up one morning and seeing that all of your roses (or other prized flower or vegetable) have been eaten like candy the night before by nocturnal deer wandering your neighborhood. Garden border edging helps keep weeds out and makes trimming easier and it can also keep gravel and rock from invading your grass lawn. Whether you decide to install your border/edging yourself or hire someone to install it, you will no doubt enjoy the clean edges and defined way your property looks after it is finished. Who can deny the spectacular beauty that live plants have to offer? Flowers and other greenery provide the opportunity to decorate and invigorate your personal living space. From offices and indoor rooms to those outdoor living spaces, you can elevate any decor with a perfect display of plants. Vases are a convenient way to store cut flowers but you can really do so much more when you arrange your plants within the confines of an eye-catching stand. A versatile plant stand gives you many more decorating options and will win you rave reviews from envious friends. Tall stands with multiple shelving spaces can handle a large number of plants. The vertical height makes the most use of the available room and can also become an interesting architectural detail. Harsh lines or sharp edges can be softened with trailing verbena, lush sweet potato vines or an array herbs that flow effortlessly over the edges of the plant stand. Make your home, deck and yard much more attractive with personally chosen plants that reflect your sense of style. There are hundreds of plant choices from which to select your favorites. Combine fragile ferns with trailing bacopa or brightly hued petunias. Why leave your special flowers lingering in heavy, unattractive pots? Create new floral beauty with arrangements that you can place in wrought iron plant stands. To add visual appeal there are stands for plants that feature unique lines, colors and materials. These stands are available in dozens of different styles. You can find rectangular shaped stands that can be placed beneath a large window. There are curved plant stands that can frame each side of the entry door or walkway. Some stands for plants are especially designed for whimsical beauty. These include stands that are fashioned to resemble wheelbarrows, teacarts or small tricycles. Each of the stands includes dedicated sites, which will hold your flowers, greenery and vining plants. The structure is solid yet very easy to move about when a new location is desired. You can create a new focal point for an outdoor cottage garden by choosing stands for plants that have dramatic structural lines such as tripods, baker's racks or obelisks. Arrange smaller plant stands along the garden path or along your deck to capture the eye of the viewer. Whenever the mood strikes you can rearrange these same plant stands to create new and exciting flower combinations. When considering the many different ways to furnish a home, one of the most trendy and fashionable ways to compliment the interior design of a home is with decorative iron wall hangings. Such pieces might accompany an overall Gothic theme when furnishings such as black tables, pottery, black and white rugs, Japanese screens, and black flower vases are included. When selecting decorative iron wall hangings select unique pieces that will allow for personalization, while still maintaining an overall Gothic theme. Wall hangings might include subtle pieces such as iron door accents, cast iron clocks, or iron plant hooks. Iron works sculptures and wall hangings, cast iron plaques for hanging coats and hats on can also be used, along with black wood or iron bookcases or shelves. These elements will create an interesting Gothic theme. Other pieces that could be included are butterfly wall art, monogrammed scroll grille wall art, Victorian style metal wall sculptures, or a coat of arms monogrammed metal wall grille. Other possibilities are cast iron picture frames, fireplace utensils, and candle holders. A masculine approach to the Gothic style might be to use cast iron fish bones, cast iron and marble handled swords, cast iron door keys, boat anchors, and cast iron lion faces. To create this style throughout the home use decorative cast iron tile art in kitchens, cast iron wall planters, iron key hooks, bells, mirrors, suns, moons, angels and stars. Cast iron chimes, crosses and figurines on shelves could also be used. The cast iron theme can also be carried to bed frame selections in selecting cast iron frames, decorative footstools, and night tables. Decorative cast iron wall art can be created by using cast iron circles with center cushions, with colored ribbons. These can then be used as pin cushions for sewing, or as jewelry hangers. Make selections and create personal style by selecting items that not only create a Gothic theme, but reflect and create personal tastes, individuality and uniqueness. Cast iron picture frames, and cast iron votive candle holders could used, as well as gargoyles on cast iron shelves or used as decorative cast iron wall hangings that double as lamps or lighting is also a good choice. It's also possible to create an overall Gothic theme for the home by continuing the style in outdoor living spaces, with black iron patio furniture, cast iron garden doors, and other decorative garden items. Grow roses and place decorative iron wall hangings on outside walls as well. On the outside of the home, place decorative cast iron wheels, cast iron fairy silhouettes, and cast iron ground markers. Be imaginative, and create an outdoor scene with decorative fairy figurines, flowers, and prayer stools. Select cast iron figures and garden gates, mixed with other interesting pieces such as stone children, angels, and garden animals to create a mix of colors, and a style that reflects an overall Gothic theme for the entire home. Cast iron decorative door stops add charm to a home and can last for generations. Initially these pieces were meant to be functional in the 1800's, but in the past few decades they have become purely decorative. Antique door stops are now considered to be American Folk Art and can be quite valuable. Drawn in by their warmth and whimsy, today many people collect old and new cast iron door stops. Antique door stops are prized and cherished, but it's difficult to discern genuine articles from reproductions and frauds. If you're planning to spend a good deal of money on an antique cast iron door stop consider purchasing a book to help you or have an expert appraisal. However, there are a few key signs a buyer should always be on the lookout for. First, an antique door stop will be completely smooth to the touch. The craftsmen who first made these spent hours grinding down the surfaces on the door stops. Modern door stops will feel sandy or rough. Second, many door stops are assembled together from multiple pieces. An antique door stop will have pieces perfectly aligned so the seams are hardly noticeable. Modern pieces may have large gaps. Additionally, any bolts holding an antique piece together would use flat head screws that almost disappear. Modern door stops generally use Phillips head screws that aren't flush against the piece. Finally, paint on an antique door stop will have worn in the expected places (generally the base and the top). Excessive wear in odd places is a sign of a reproduction. For those on a smaller budget, there are more reasonable options. Modern cast iron door stops are made in a variety of shapes, sizes, and colors to make sure there is a selection for every personality. Some door stops can even double as a boot scraper, making sure that the messy outdoors stay outside. Additionally, if you have a door stop that's in poor condition you can repaint it to bring new life to the piece. Only use oil based paint on cast iron. Water or latex based paint will easily chip off. Also, never repaint an antique door stop unless you're an expert, or you greatly damage the value. Cast iron decorative door stops have retained their popularity over the decades thanks to their simple beauty. Those in the market for an antique door stop need to proceed with caution to make sure they don't end up with a high-priced reproduction. Modern door stops can still delight for a smaller price and come in a huge variety of themes. No matter which route is chosen, a cast iron door stop will last for generations. Purchasing a metal garden gazebo to enhance and beautify a home’s exterior can be a great investment, adding to the décor and atmosphere of any yard or garden. Metal garden gazebos can be chosen from many different styles, which can add an aura of elegance to the landscape surrounding it. These fanciful structures can serve many structural purposes, such as providing a canopy under which anyone can rest and take advantage of the shade provided, giving one a place to sit peacefully, enclosed by it ambiance while enjoying a good book or to relax and take advantage of the pleasant setting along with friends and family. Metal garden gazebos may be most popular for being used as a design element in outdoor settings. However, they can be utilized for many different purposes, making it a very versatile addition to any home. The gazebo can provide a lovely background for family pictures, special ceremonies and parties, and for photo taking on occasions such as homecomings, proms, graduations, or even weddings. Gazebos can be found in diverse varieties of designs, such as in the forms of classically arched structures, flowers, and modern day architectural designs. It can be of value to note that the quality of the metal used to construct them is also an important component to consider when deciding on what type of gazebo to purchase. Many of the gazebos available at the “Big Box” stores are constructed of anodized steel, which when exposed to the elements, especially in temperate climates, may last for a few years but certainly can’t be considered a long-lasting design element due to rust. Just when one has trained a perennial, vining plant to climb on it, the structure is probably ready to collapse due the depredations of rain, snow and temperature. To any seasoned gardener, this is just not acceptable. Aluminum is a more durable construction material, but finding one constructed of it is difficult and can carry a much higher price tag. In a permanent garden setting, there would still be an issue with strength. Wooden ones may stand the weather test a little better, but yearly maintenance is a must if permanence is desired. Wrought iron gazebos would be at the top of anyone’s list if durability were an issue, not to mention their beauty and graceful ornamentation. The manner in which wrought iron is made makes it a perfect choice for a gazebo, in that it is practically weatherproof, very strong and fairly maintenance-free. Take a look at wrought iron fences surrounding vintage homes and churchyards; the strength, beauty and durability of them are unparalleled. This material stands the test of time. While the initial investment may be higher, the long-term benefits just can’t be beat. Add to this the fact that most wrought iron gazebos are constructed here in the States by artisans who value their craftsmanship and designs. The shape and design can be matched to the house and garden it will be accompanying, complementing them all. It could be a heavenly scene, with vining plants wrapped around the uprights, bird feeders attracting nature’s own musicians and accented by hanging plants heavy with bloom, which may draw in their fair share of visiting hummingbirds. With this in mind, a metal garden gazebo can prove to be a delightful addition to anyone’s home. Outdoor living spaces have definitely changed through the years. Gone are the days where homes feature regular old wooden decks. These boring decks usually had a few plastic chairs and a side table. Although decks do offer ample space for entertaining and relaxing, they do not incorporate a homeowner's unique style and taste. Today, many outdoor living spaces are completely elegant and offer the comfort formerly reserved for indoor spaces, with patios offering overhead cover to homeowners and their guests. Everyone can stay cool under this shade considering that the use of ceiling fans and outdoor lighting is so popular. More and more people are even installing outside chandeliers to their patios and porches. There are thousands of these chandeliers on the market, but it is important to chose the proper type of these beautiful pieces of lighting that are designed for the outdoors. With the weather constantly changing, hanging a traditional chandelier outdoors can cause many problems. Traditional chandeliers are not equipped to handle the outdoor elements. Rust and flaking can occur to the fixture if it is exposed to the elements. Fires can occur due to some sort of electrical malfunction. Homeowners should only purchase outside chandeliers that have been specifically designed to withstand any outdoor elements. Many outdoor lighting elements feature industrial looking designs. However, homeowners can rest easy in knowing outside chandeliers now feature beautiful and elegant features. Many are made out of durable wrought iron so rust and flaking will not occur. Some outdoor lights can also be created using wood. These wood chandeliers are excellent additions to screen porches or gazebos because they offer a more natural look. Chandeliers created for the outdoors can also feature crystals and sequins to add more sparkle and elegance to an outdoor area. While many of the structures feature actual electrical lights, some outdoor chandeliers offer spots for candles. Candle lighting is and always will be a great way to set a mood with romantic lighting. Candles also take out the worry of having to complete any electrical work, which may require a licensed electrician. Plus, candles can be used to deter any bugs with the use of citronella candles. Many homeowners prefer outdoor chandeliers that offer lighting with the use of candles, both for the insect-repelling benefit, and the gentler, more relaxing atmosphere. No matter what type of outdoor lighting you prefer, choose a chandelier for a more unique look. Outdoor spaces can easily be changed from boring to elegant with a special lighting fixture. From rustic wooden chandeliers to gorgeous crystal and wrought iron pieces, homeowners can have a beautifully lit outdoor space in their homes. The beauty and value of a property can be improved with new garden gates and fencing. While a conventional chain link fence is functional, it is also rather dull and utilitarian, and suggests a less prestigious station in life. There is nothing shallow about beautifying a home; anyone who wishes to complement an attractive yard or garden front should seriously consider wrought iron garden gates and fencing. Wrought iron is not a normal metal. It has been used for centuries, but is now more typical only on older homes. There are steel facsimiles that look nice but just are not the real thing. Wrought iron is valuable because the ore is heated and then processed many times to create the metal used. A traditional blacksmith once had to dedicate an entire evening to make a single gate. Wrought iron is still prized for its scarcity and authenticity. A multistory home that suggests age, distinction, and nobility deserves accessories that complement its flavor. The house was not a minor investment, and an original iron gate provided by an independent craftsman is not a demanding outlay for all that is gained in return. These gates are strong, coated so it will not rust in rain, and has a genuine rustic beauty that can be quite a showpiece. Like a frame on a work of art, a fence helps to frame a beautiful house. Gates and fences will never go out of style. They help to secure a yard from strangers and roaming animals and also provide a support for edging plants. They are beautiful additions and have long been associated with wealth and exclusive communities. If neighbors all have attractive gate systems, it might be time to consider an equally appealing and complementary installation. It is one thing to buy a facsimile garden gate and fencing; it is another thing to procure genuine wrought iron fencing. The long lasting quality, strength and timeless elegance of wrought iron will support any additional outlay. Because every gate is an original, there are many shapes and styles to choose from. They are all lovely, but some people want high gates while others want something below waist height. There is something for every customer, and it could simply boil down to a matter of personal taste. All are invited to examine the many existing works of art on display. They are reasonably priced and are guaranteed by the manufacturer. For that matter, the selection extends beyond a front for the street-facing yard; some models are designed to confine pets or to provide an arch that provide a focal point through which guests pass through to an open and public area, or a secluded and private patio. Gazebos can be assembled from wrought iron parts, and it is all functional, beautiful and long lasting. While the modern blacksmith does use mechanical anvils and other modern devices, the difference is still an astonishing array of originality. Nearly anything is possible, and the artisans who make these timeless, functional pieces of art are capable of taking special requests.